I suddenly noticed a crack in my frame. Is it practical for me to use glue to seal it off as a temporary solution? Edit: Further information ...two incidents so far. Someone opened their driver side door on me and I slammed into it. That considerably weakened it. Then I fell again while turning a sharp corner, it broke it. I went to a bike shop and they told me they could not replace it; I need to talk to the shop where I bought it from and get a replacement from them. Does it have to go this way? I would imagine this fork could be easily replaced. The consequences of fork failure are likely to be severe and painful. This may only be a secondary fork crown but it's still structural. The fact that it's such a wide crack means something is already deformed and weakened. Any glue joint would be under huge stress and aluminium doesn't glue well. If this happened out on the trail it might be possible to ride back to civilisation at walking pace on a fire road, but I'd probably rather scoot the bike standing on one pedal. As your picture indicates it's indoors, you need a new fork before riding it anywhere. I wouldn't even ride it to a bike shop. More generally (thanks to cmaster): Never ride a bike where there's so much as a crack in a) the front axle, b) any part of the fork, including the steering tube, c) the stem, or d) the handlebar. There is zero backup for any of these parts, and failure usually means immediate loss of control and consequently unmitigated crash. That's not a "crack" – it's broken in two! You need a new fork. Your current fork has completely failed. Any attempt to repair it will create a massive weak spot which will just break again. Anything going wrong around your front wheel has the possibility of throwing you over the handlebars into the path of a truck. Furthermore, a significant piece of structural metal on your bike has broken. Unless there was a pre-existing crack, whatever did that must have applied a huge force. Check very carefully that nothing else on your bike is damaged. As others have said the fork is trash and the bike should not be ridden. 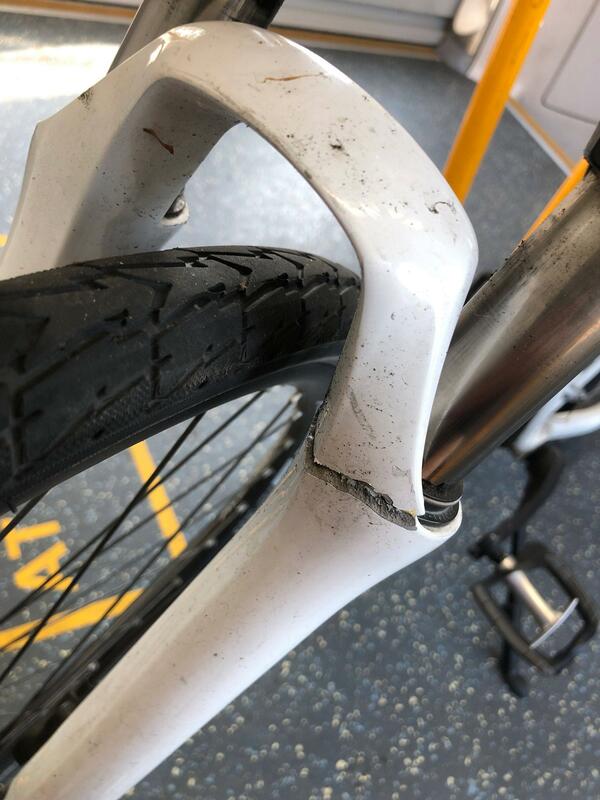 Given the nature of the incidents that led to the fork breaking (described in comments), the rest of the bike should be checked for damage, especially the front wheel and headset area of the frame. Re: fork replacement: any decent bike store with a competent repair shop should be able to order and install an replacement equivalent fork, even if it is of a different brand. If the fork is branded the same as the rest of the bike, that may be why the bike store told you to go to the store you bought the bike for. Find a different store that is more willing to help. Can anyone identify this bike please? can anyone help i.d. this bike? Did my bike frame crack?